The bookstore at the Protection of the Holy Virgin Orthodox Church in Cabramatta carries an large array of books in Russian and English on spiritual topics plus liturgical books in Church Slavonic and English. In addition a variety of other items including icons, incense, baptismal crosses, babushka dolls, church puzzles and jewellery boxes. Вечером 17 апреля 2013 года, в канун четверга 5-й седмицы Великого поста, Святейший Патриарх Кирилл совершил утреню с чтением Великого покаянного канона преподобного Андрея Критского и жития преподобной Марии Египетской в кафедральном соборном Храме Христа Спасителя в Москве. 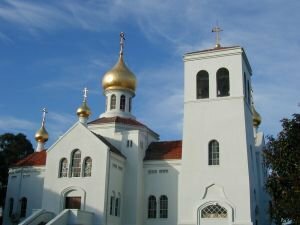 A financial crisis has hit Holy Trinity Monastery in Jordanville, NY, because of a series of structural, electrical, and plumbing issues. Metropolitan Hilarion led a special task force from the Eastern American Diocesan Council to Jordanville on December 14th. The purpose of the trip was to investigate the problem and offer assistance to the brotherhood. Our diocesan film crew traveled to Jordanville with the Metropolitan to produce this documentary. To help Jordanville please visit http://www.fundforassistance.org. 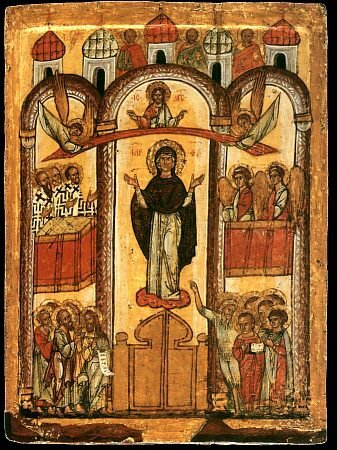 “The Virgin today doth stand forth within the Church, and with the choirs of the Saints invisibly for us doth pray to God: angels with hierarchs make reverence, and apostles with prophets sing forth: for us the Birthgiver of God prayeth the Praeternal God” — this miraculous appearance of the Mother of God occurred in the mid-X Century at Constantinople, in the Blakhernae church where there was preserved the Robe of the Mother of God, Her Head-Veil (mathoria) and part of the Belt-Sash, transferred from Palestine in the V Century. On Sunday, 1 October, during the time of the all-night vigil, when the church was overflowing with those at prayer, the Fool-for-Christ Saint Andrew (Comm. 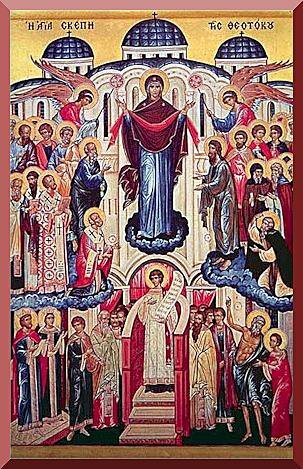 2 October) at the fourth hour of the night lifted up his eyes towards the heavens, and beheld coming through the air our MostHoly Lady Mother of God resplendent with an Heavenly light and surrounded by an assembly of the Saints. The holy Baptist of the Lord John and the holy Apostle John the Theologian accompanied the Queen of Heaven. On bended knee the MostHoly Virgin began with tears to pray for Christians and for a long time was at prayer. Then, coming nigh the Prestol’-Throne, She continued Her prayer, which having completed She then took from Her head the veil and spread it over the people praying in church, protecting them from enemies both visible and invisible. The MostHoly Lady Mother of God was resplendent with Heavenly glory, and the protecting veil in Her hands gleamed “more than the rays of the sun”. Saint Andrew gazed atrembling at the miraculous vision and he asked of his disciple Blessed Epiphanios standing alongside him: “Dost thou see, brother, the Queen and Lady, praying for all the world?” Epiphanios answered: “I do see, holy father, and I be in awe”. The Ever-Blessed Mother of God implored of the Lord Jesus Christ to accept the prayers of all the people, calling on His MostHoly Name and hastening in recourse to Her intercession. “O Heavenly King, — sayeth in prayer the Immaculate Queen standing aethereally amidst the Angels, — accept every person, that prayeth unto Thee and calleth on My Name for help, let them not go empty away unheard from before My Visage”. Saints Andrew and Epiphanios, granted to behold the Mother of God at prayer, “for a long time did gaze at the protecting veil spread over the people and the lightning like flashes in glory to the Lord; as long as the Most Holy Mother of God was there, so likewise was the protecting veil visible; but with Her departure it likewise became invisible, and though having taken it with Her, She left behind the grace of having been there”. At the Blakhernae church was preserved the memory of the miraculous appearance of the Mother of God. In the XIV Century, the Russian pilgrim and clerk Aleksandr saw within the church an icon of the MostHoly Mother of God praying for the world, and written such, as depicting Saint Andrew in contemplation of Her. But the Greek Church does not know this feast. [trans. note: i.e. does not historically celebrate this feast. Our Russian source is here reticent concerning the historical circumstances occasioning the necessary protective intercession of the Mother of God, and it reflects a great irony, that for the Russians rather than for the Greeks this should be an important feast, since it celebrates the Divine destruction by a storm of a large pagan-Russian fleet under Askold and Dir which threatened Constantinople itself, sometime in the years 864-867, or per the Russian historian Vasiliev on 18 June 860. The Russian Primary Chronicle of Saint Nestor notes this miraculous deliverance following the all-night vigil and the dipping of the garment of the Mother of God into the waters of the sea at the Blakhernae church, but without mention of Saints Andrew and Epiphanios and their vision of the Mother of God at prayer. These latter elements, and the beginnings of the celebrating of the feast of Pokrov, seem to postdate Saint Nestor and the Chronicle. A further historical complication might be noted under the 2 October entry for Saint Andrew — that of his demise in the year 936. Either this year of death might not be quite reliable, or that he survived into quite extreme old age after the vision of his youth, or that his vision involved some historically later pagan-Russian raid which met with the same fate. The below suggestion likewise that the Saint Andrew of the vision was a Slav (or a Skyth per other sources, such as S. V. Bulgakov) — is a nice touch, but not necessarily chauvinism: the extent of historical South Slavic penetration and re-population into Greece is the stuff of scholarly disputes]. In the Prologue, a Russian book of the XII Century, is contained a description about the establishing of the special feastday in honour of this event: “For lo, when we heard, — we realised, how wondorus and merciful was the vision and moreover an expectation and intercession on our behalf, without celebration… and it transpired, that Thy holy Pokrov-Protection should not remain without festal-celebration, O Ever-Blessed One!”. Wherefore in the festal celebration of the Divine-services to the Pokrov-Protection of the Mother of God, the Russian Church intones: ” With the choirs of the Angels, O Sovereign Lady, with the venerable and glorious prophets, with the First-Ranked Apostles and with the PriestMartyrs and Sainted-hierarchs pray Thou for us sinners, glorifying the feast of Thine Protection in the Russian Land”. And moreover, it would seem that Saint Andrew, contemplating the miraculous vision, was a Slav, taken captive and at Constantinople given over into slavery to the local inhabitant named Theognost. Churches in honour of the Pokrov-Protection of the Mother of God appeared in Russia in the XII Century. Widely known on its architectural merit is the temple of the Pokrov at Nerla, which was built in the year 1165 by holy Prince Andrei Bogoliubsky. Through the efforts of this holy prince was also established in the Russian Church the feast itself, the Pokrov-Protection of the Mother of God, in about the year 1164. At Novgorod in the XII Century there existed a monastery of the Pokrov of the MostHoly Mother of God (the so-called Zverinsk monastery); at Moscow also under tsar Ivan the Terrible was built the cathedral of the Pokrov of the Mother of God at the church of the Holy Trinity (known as the church of Saint Basil the Great). On the feast of the Pokrov Protection of the MostHoly Mother of God we implore the defense and assist of the Queen of Heaven: “Remember us in Thine prayers, O Lady Virgin Mother of God, that we perish not by the increase of our sins, protect us from every evil and from grievous woes; for on Thee do we hope, and venerating the feast of Thine Pokrov, Thee do we magnify”. Православная энциклопедия. Дата эфира 29.09.12 г.
Программа посвящена одной из самых северных епархий Русской церкви, недавно ставшей митрополией – Архангельской. Зрители узнают о святых и святынях поморской земли, а также увидят, чем сегодня живет этот обширный край – родина Ломоносова и Иоанна Кронштадтского. Our bookstore has just received the following titles in Russian. “Весеннее антихристианское обострение: Что это было?” – прот. Влидимир Виглянский. “Трудно быть русским” – Александр Крутов (редактор журнала Русский Дом). “Стать православным” – Александр Крутов. The Bookstore is open after the Divine Liturgy every Sunday and on Great Feasts of the Church or by appointment – tel. (02) 9150 6454.